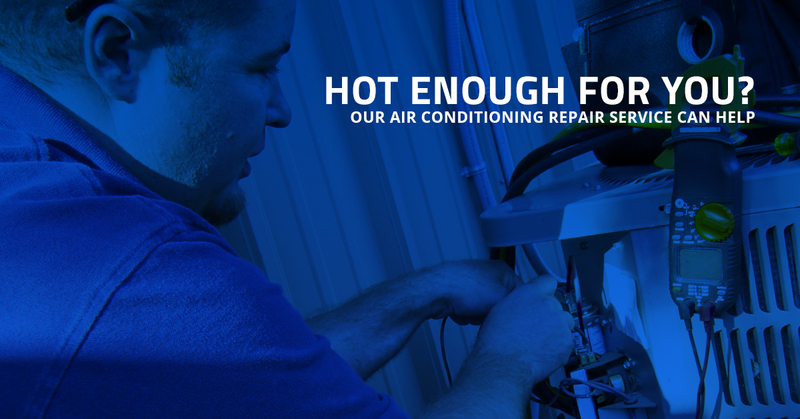 There’s never any question when you need emergency AC service. You leave the house in the morning and the house is a perfect 75 degrees; but by the time you get home it’s 95 and the heat bowls you over when you open the door. You check the thermostat, and it’s still set at 75, so that’s not the problem. Before you call us for air conditioning repair service, you might go outside and see if there’s any visual indication as to why it’s not working. Maybe you see something, maybe you don’t. Either way, it’s obvious that it’s time to call someone to take a look at your HVAC system. After you answer a few questions for us, we’ll try to get out there the same day. In the meantime you might want to open the windows, turn on the ceiling fans, and even bring up the box fan from basement storage. Stay hydrated. If it’s just too hot to take, you could head out a see a movie in a nice air-conditioned theater until it’s time for us to show up. After all, when the temperature is too high a hot home can be dangerous. 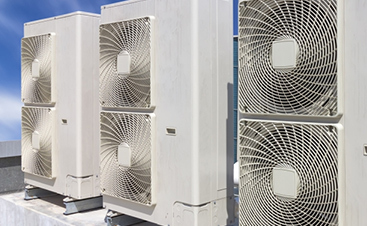 You might wonder, what are the most common problems that can occur with air conditioning units. 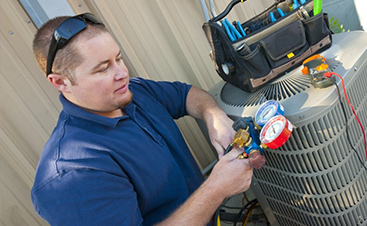 Let’s take a look at the AC services we most commonly perform. If you walk past your air conditioner when it’s working properly, you notice the big fan on top that blows hot air and is the cause of most of the noise associated with air conditioners. This fan is critical, in that it is taking the hot air from your home and sending it outside. Without it, the air conditioner would have to work even harder to cool the air in your home. If this fan isn’t working, it’s possible that the motor has given out. If this is the case, we can replace it and get everything up and working again. The compressor is the heart of the air conditioning unit. When it doesn’t work, you’re not going to get the cool air you want. It supplies energy to the refrigerant, compressing it and turning it into gas, which moves through coils and creates the heat exchange necessary to make your house comfortable. A problem with the compressor could be major or minor, as it contains many parts. If there’s a problem with the compressor and your unit is relatively new, you probably don’t have much to worry about. If your AC unit is more than 15 years old, you might want to plan for getting a new one. You won’t be surprised to know that an air conditioning unit requires refrigerant in order to work. If the refrigerant wasn’t properly topped-off during installation or a previous repair, it might just need to be filled to the proper amount. However, it’s much more likely that there’s a leak that has occurred. Simply filling it with more refrigerant won’t work, because it would be like trying to fill a bucket that has a hole in it. The leak will have to be repaired before the refrigerant is replaced, and the HVAC technician will test it to make sure that the repair sealed properly. With air conditioners being on the outside of the house, they are subjected to quite a bit of dust in the air. Dirty coils will prevent it from working properly and will cause other parts of the unit to have to work harder, putting more wear and tear on every part. While dirty coils by themselves won’t be the reason your house is 95 degrees, they could lead to the something else failing. We recommend yearly air conditioner maintenance so that your unit can hold up for years to come. You’ve probably seen the complexities of your furnace whenever you open it up to change the filter. Air conditioners, on the other hand, are a closed box on the outside of your house; you probably never stop to think how complex they are on the inside. There are many electrical components inside your air conditioning unit, and they have to hold up to the heat of summer, the freezing cold of winter, rain, and snow. And when it’s incredibly hot outside, they also have to turn on multiple times a day, which could be the final straw that finally makes the electrical system give out. If your compressor controls wear out, it’s not going to cause that wonderful cool that you enjoy from a unit that’s functioning properly. As we were just discussing, air conditioners have to contend with a lot of temperature swings and inclement weather. There are wires that are both inside and outside of the unit, and over time the contacts on these might become corroded or rusted. This problem can be exacerbated if the wiring wasn’t done properly during the initial air conditioning installation (the HVAC company might have put in a dozen a day in your housing development). Cleaning the contacts and ensuring the wiring is in good shape could get your AC back up and running. Sometimes it’s simply time to replace your old air conditioner. Enough could be wrong with it that it just makes sense to replace the whole unit, and we’ll be there for your air conditioner installation. Just like with new air conditioning units, having a failed thermostat can actually be a good thing. Smart thermostats can help you set the temperatures better throughout the day so that you’re not cooling the house when you don’t need to. A new thermostat can help save you money, so if your ancient one has given up the ghost, you should probably be glad that you’ll be able to save energy with a new one. 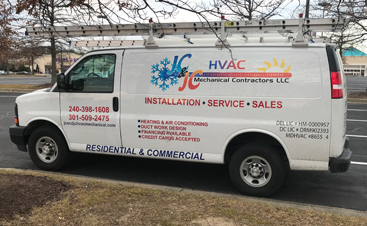 No matter your HVAC problems, JC & JC will be there to help you, whether you’re in Beltsville, Rockville, Silver Spring, Laurel, or anywhere in the surrounding area. Contact us at the first sign of trouble!